Purity rings, chastity rings, abstinence rings and promise rings ~ all names that symbolize a young woman or young man's vow to remain chaste until marriage. This vow is made by the wearer to him/herself, to the presenter of the ring, and for Christians, to God. This type of ring can also be worn by anyone who wants to change their way of life. Two of our most popular purity rings are the "Unblossomed Rose" Purity Ring #1318 and Diamond Link Purity Ring #1073. 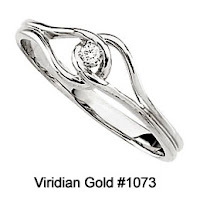 In this pretty ring, the two links represent the wearer and the one she will eventually marry. The diamond symbolizes Christ, the foundation of her commitment to purity, and the foundation of her marriage to her future husband. We also offer chastity and purity rings in sterling silver, such as our "Love Waits" Daisy Purity Ring #1086 and the Covenant Hearts Chastity Ring #1039, a designer original by Evan Trinkle. This ring is fashioned with three hearts that symbolize the presenter's commitment to the wearer, the wearer's devotion to God, and the wearer's devotion to life vocation or the one she will eventually marry ~ all three interwoven to represent purity before God. The cross that sits atop the hearts is a visual reminder of Christ's victory over sin through His death and Resurrection. 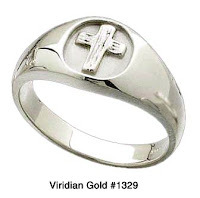 For young men, there are numerous cross and crucifix rings in both sterling silver and 10-14K gold that can be worn as either as purity ring or proclamations of faith, such as our Young Man's Cross Chastity Ring #1329 and "Rugged Cross" Ring #1310 (both rings available in sterling silver, 10K or 14K gold). Chastity ring gift sets that include a navy blue ring box and pouch, as well as a gift card with a poem about virtue, can be purchased for only $2. Visit our Gold Cross and Crucifix Rings to view all our cross rings, and Sterling Silver Religious Rings to view all our religious rings in .925 sterling silver. Abstinence jewelry does not have to be a ring ~ it can also be a necklace or pendant, a cross pendant, or even a bracelet. 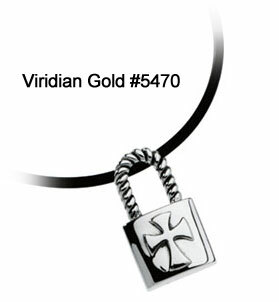 See our Abstinence Pendants for a selection of purity and chastity pendants for both young ladies and young men. And check out our selection of religious bracelets, and our many Cross Pendants. If you need assistance in making a selection, please give us a call ~ we are always happy to help!